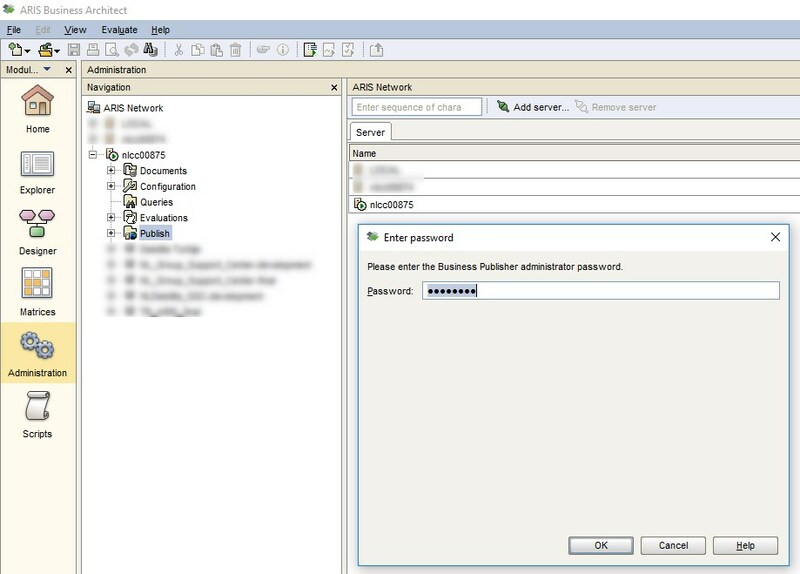 Can I reset the password for "Business Publisher administrator" in Aris Business Architect 7.2 client? Hello, I have to make a new export via Publish in the Aris Business Architect 7.2 client, but I get a password pop-up. And you guess.... I don't know the password. Is there a trick to reset this password? I added a screen dump of the alert. 2. Aris Business Server must be stopped before the change. 4. You cannot reset but only delete the password this way. After the change and restart of ARIS Server the password would fall back to the default BPADMIN. The tag <passwords> holds entries for the administrative users like SITEADMIN, SCRIPTADMIN and hopefully BPADMIN. (This is where my memory is weak) Either delete the hashed password value for the BPADMIN user or delete the whole line. Hi Martin, thanks for your reply. I didn't find any lines pointing to Publisher. Can I do something with this line? I found the hashed code for the default password and added that in the properties.xml.